The craze surrounding PascalCoin (PASC) continues, but aside from solo mining with a very high difficulty that is viable only for very large miners, users with less GPUs and significantly smaller hashrate can now use the first available PASC mining pool from Nanopool. 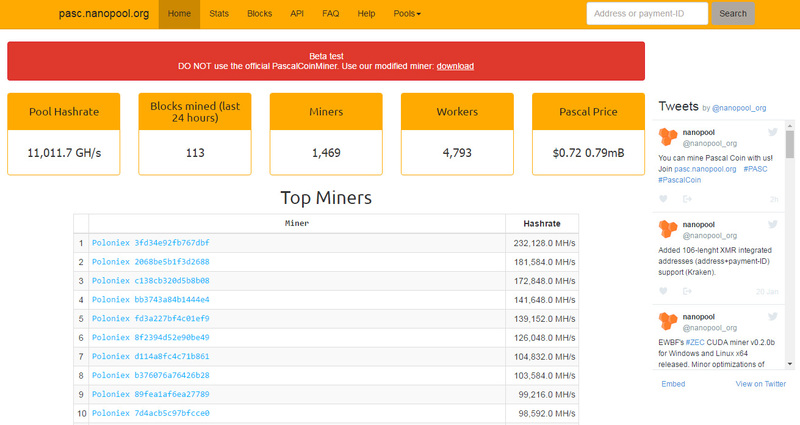 Do note that the Pascalcoin mining pool does currently have some limitation such as the availability only of a 64-bit Windows miner and you need to use the specially modified miner for the pool. Also the minimum payout is 1 PASC with with block reward confirmation after 110 blocks and the pool uses PPLNS payout scheme where N is defined as all submitted shares during the last 3 hours. 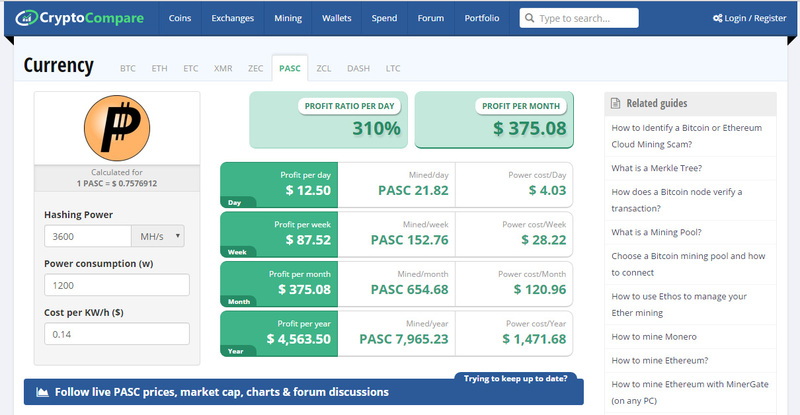 Among the good things is the fact that you don’t really need to have a PascalCoin account to mine on the pool (you need to find a block yourself to get an account), instead you can directly mine to an exchange’s account such as Poloniex. You only need to make sure that aside from the exchange address that you will be given you also set the correct unique payment-ID or payload in order to be able to get your payments. It is interesting to note that all of the top miners in terms of hashrate are mining directly to Poloniex addresses, obviously with the idea to trade the mined coins and not keep them long term. This may as well mean that the current high exchange rate may not be able to keep up the selling pressure and as soon as the first pool payments hit it may start dropping, so be wary of that as well. In the above example you the very important part is the one after the -n parameter, where first you set the account address (86646-64 is for Poloniex), then the second part after the point is the unique ID being generated from the exchange and after that you can set the worker name such as 480s in the example. The other parameters such as server address, the platform ID and device IDs that will be used for mining are pretty much the same as for the miner available for solo mining aside from setting the pool address of course. If you are looking for a mining calculator for PASC you can check out the one provided by CryptoCompare here. Be careful with the estimates the calculator is giving you as by the time you actually mine some coins and have them confirmed (it could take a couple of hours) the numbers might be very different. Also make sure that you measure the power usage of your mining rig(s) as the algorithm used by PascalCoin can be more power hungry than what you were lately used in terms of power consumption by other popular crypto coins such as Ethereum or Zcash for example.